I met Lee at Capital Hyundai while purchasing a 2007 Sante Fe for the family (My MGB doesn't cut it as a family car). He drove up in the Spitfire and my wife had to close the transaction as I was otherwise preoccupied. Here is his email with a pic. As you mentioned today I would like to get the info on your club tours, etc. Seems everyone has a picture here so I will add mine. 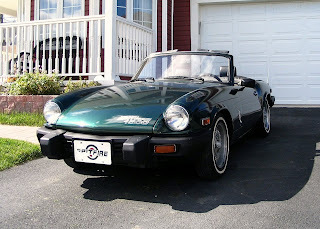 This is a 1980 Spitfire 1500 the last production year it’s a Canadian spec, with 111150 kilometers, I am the third owner and I have the original papers. I have all the info on this vehicle, history production date etc. I think you have something here with this idea every other province has a British Car Club, anything I can do to help just let me know. Thank for the invite to be part of this.